I have been asked more than once if I thought the topic of brands taking stands on the big issues of the day is a trend that will eventually run out of gas. My answer is always the same: Get used to it. This is a movement, not just a meme of the current overheated political moment. There is, however, no doubt that the in-your-face, stir-it-up tactics of the current administration have heated the concept up to a boil. Companies ranging from multinational corporations to startups are increasingly staking out public positions on hot-button, sociopolitical issues. 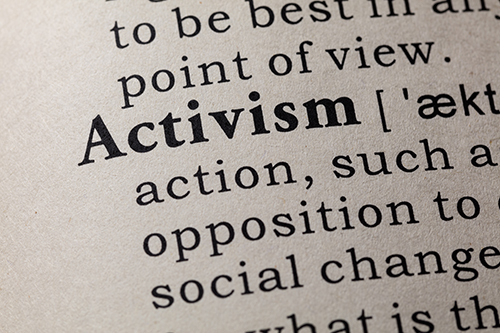 Overt activism now permeates every level of business, from C-suite to employees. Consumers and markets are evaluating ethics in practices and purposes in strategies from the companies that provide the goods and services they buy. Investors are demanding more and better transparency in governance. Apart from the recurring headlines, new data supports the belief that this idea shows no sign of abating any time soon. This year’s annual Edelman Trust Barometer found that 84% of those polled expect CEOs to inform conversations and policy debates on one or more issues, while 64% thought that CEOs should take the lead on change [my italics] rather than waiting for government to impose it. Another survey, “Brands & Stands: Social Purpose is the New Black” by the Shelton Group, concluded that 86% of consumers believe companies should take a stand on social issues. Athletes have become the latest occupational category to take leadership on speaking out about social and political issues. With their high visibility and especially their large social media followings, athletes are well positioned to make statements that make news. Perhaps the most well known example in recent years is that of Colin Kaepernick, the former NFL quarterback credited with starting player protests across the league in 2016 by kneeling during the national anthem to protest racial injustice. Now Nike has named him as one of the faces of its 30thanniversary campaign to commemorate the company’s famous “Just Do It” slogan. The new ad features the message: "Believe in something. Even if it means sacrificing everything." Kaepernick would know well the meaning of that last phrase: He is now suing the NFL for allegedly colluding to prevent him from playing football—he has not played in the NFL since being released in 2017. However, his Nike contract is termed a “star” contract worth millions per year plus royalties. 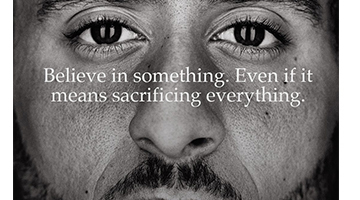 To Nike, Kaepernick is a “star” of principle: "We believe Colin is one of the most inspirational athletes of this generation, who has leveraged the power of sport to help move the world forward," Gino Fisanotti, Nike's vice president of brand marketing for North America, told ESPN. Interestingly, Fisanotti also said that this new version of the 30-year old campaign is aimed at 15- to 17-year olds—a big gesture of support to the overt idealism of Gen Z, and a straight-ahead effort to connect the Nike brand with the activism shown by that cohort. 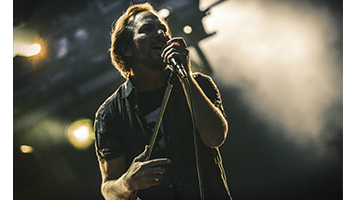 Band Taking a Stand: Pearl Jam raised $11 million in two concerts. Donations were made to 40 Seattle organizations that address homelessness. Free Rides to the Voting Booth: Lyft announced that it will offer free and discounted rides on Election Day, November 6, to encourage voters to get to the polls. The ride-hailing firm has an existing free ride program for emergency situations and non-emergency ones involving veterans and job seekers. 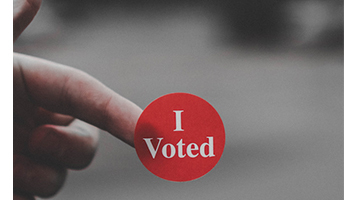 Now, it’s teaming up with Vote.org, TurboVote and Nonprofit Vote to distribute 50% off promo codes to those who need them. It's also working with nonpartisan and nonprofit orgs, including Voto Latino and Urban League, to provide free rides to underserved communities in an effort to give them a way to exercise their right to vote these midterms, reports engadget.com. “As president and CEO of a values-driven company that’s known the world over as a pioneer of the American West and one of the great symbols of American freedom, I take the responsibility of speaking up on the important issues of our day very seriously. We can’t take on every issue. But as business leaders with power in the public and political arenas, we simply cannot stand by silently when it comes to the issues that threaten the very fabric of the communities where we live and work. While taking a stand can be unpopular with some, doing nothing is no longer an option. Western Union has announced that three executives are serving on non-profit boards to support the company’s local community in Denver. Jacqueline Molnar, chief compliance officer and chair of the Western Union Foundation Board of Directors, has been appointed to serve on Denver Public Schools Foundation Board. Shannon Corcoran, vice president of business change and transformation, has joined the Mi Casa Resource Board of Directors. Carrie Damon, vice president of business change and transformation, became a board member for the Junior Achievement Rocky Mountain Chapter in 2014. As part of its ongoing commitment to the Denver community, the Western Union Foundation has donated $1 million in contributions to local non-profits and made space available in its new global headquarters for local non-profits and NGOs to host community gatherings. Continue the important conversations on corporate responsibility long after 3BL Forum with the Brands Taking Stands newsletter. Written by veteran journalist, John Howell, this newsletter is published every Wednesday morning.